Do you feel blue at this time of year? Seasonal Affective Disorder affects around 20% of people in the UK. Good news: running can help manage and minimise the symptoms of SAD. After the clocks go back in the UK, many of us struggle with physical and emotional responses to the change in daylight hours. Seasonal Affective Disorder (SAD) is a very real thing, classed as a depressive illness and prompted by the shorter daylight hours and lack of sunlight at this time of year. Driving home from work in the dark doesn’t help. And, for us runners, the imposed changes to our running routine can make even our favourite hobby feel less fun. 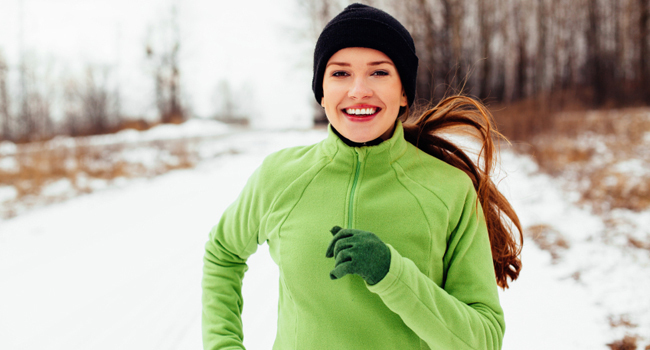 Good news for all runners: running can help minimise and manage the symptoms of SAD. Why is running so good for people who suffer from any level of depressive illness at this time of year? It’s about far more than the “runners high” of endorphins caused by running itself. One of the major reasons we might experience SAD is lack of sunlight. The UK is never blessed with huge amounts of sunlight but it’s worse at this time of year with short daytime hours, and fewer opportunities to get outside and get sun on our skin. Sunlight helps our bodies produce Vitamin D, and low levels of Vitamin D levels are linked to depression. So, any opportunity you can grab to get outside and run during daylight hours will help boost vitamin D, endorphins and feel-good hormones, minimising your chances of suffering from depressive illness, and giving you an great opportunity to feel the sun on your skin and take in your surroundings. Need a boost at this time of year? Try one of these tips to keep your running plans on track. Check out our series of great events, choose one, and get training! Run with a friend, a group or a running club. The extra motivation will keep you running through the darkest months. Even if you can only run outside during the day at weekends, make the most of it. Really focus in on any pleasant sensations, emotions, views or experiences.